In honor of this month’s premiere of Star Trek: Discovery, the Trekkers over at Vulture decided to take a look back at one of the more unconventional aspects of the sci-fi franchise that ultimately produced some of its more memorable episodes: the open-submission policy. Unlike most modern TV shows that are produced behind a veil of secrecy—where industry gatekeepers and bureaucratic roadblocks keep the general public at a distance—previous Star Trek series famously allowed aspiring writers to pitch ideas directly to the room. A few of those writers, like Ronald D. Moore or Bryan Fuller, impressed the staff so much that they were eventually brought on full time, while many others were sent away, spec script in hand, hoping to find work further down the road. Vulture reached out to some working TV writers that previously pitched for Next Generation, Deep Space Nine, and Voyager and asked them to recall what their spec script was about. For the most part, these undeveloped episodes sound pretty great, especially when you think back to some of the pretty terrible episodes that actually made it to air. Many of these specs include elements that were later used on the show to service other stories. Another spec, penned by Marc Bernardin, co-host of Kevin Smith’s Fat Man On Batman, pits the Next Generation crew against a famous villain from the original series days— Khan Noonien Singh. Ultimately, this unlikely matchup turns out to be a simulation concocted by Data to keep the Enterprise crew on its toes while traversing the vast, empty regions of space. It’s the kind of bait-and-switch script that would have lit up message boards back in the day, but is instead sitting at the bottom of dusty box in a storage locker. 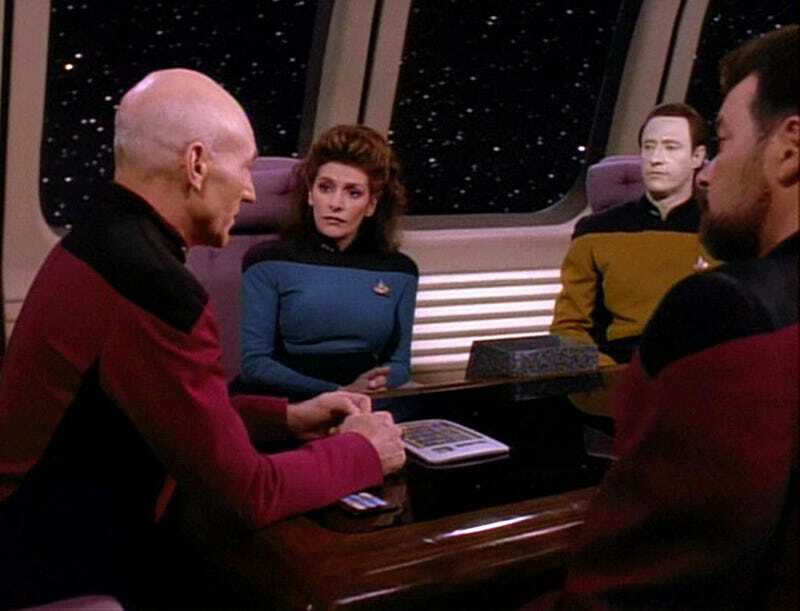 As to why these seemingly good ideas never made it out of the room, the 1995 book Lost Voyages Of Trek And The Next Generation says that “in most cases, these scripts and treatments were left unfilmed due to political reasons, studio indecisiveness or ego. In others, they just weren’t up to snuff.” It’s unclear which of these reasons stopped Steven DeKnight’s pitch for a Worf and giant Ferengi buddy adventure from making it to air, but we can all agree that was a bad call. Check out the whole list at Vulture and spend the day imagining the Trek that could have been.